Hi, I've been playing with some new dies and alcohol inks. The bottom frond is inlaid into the base to reduce bulk. I glued the right half of the top fern down and popped the lower fronds on the left hand side up with small foam dots for dimension. I'm linking up to the challenge at Less is More where it's a colour theme. I used stream, lettuce, citrus and clover alcohol inks. The only colour not used is grey, so I hope this is representative enough of the colours to meet the rules. 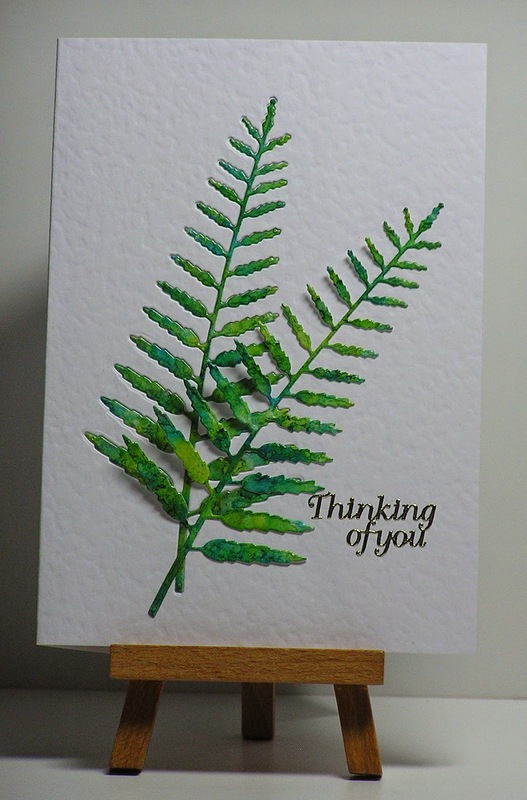 Memory Box delicate fern die; alcohol inks on glossy card stock; sentiment sticker. Gorgeous! Love how you inlaid one fern and overlaid the other! This is beautiful. Great idea to inlay the fern - brilliant! These fronds are fab Cathy !! They look so soft and atmospheric ! This is a fabulous design and your use of the colours is really subtle! Classic, CAS, and a truly elegant card! I love this one! A striking and exquisite card with a perfect sentiment. So simple and so effective, love it! Oh my these ferns are beautiful :) love the dimension ! I have that die! :) It's beautiful - and you have made a beautiful card with it, too!